I then simply cut the little elastic strap off and attach a little sticky of velcro to the finger light itself. When put on in strategic locations, its very easy to light up any plane you don't mind sticking a few little patches of velcro to. Ive been successful lighting up gliders, slow-sticks, and even more expensive models. No muss, no fuss, stick on and go. I usually buy a new pack for any night session, then give them to my kids to play with and kill. I've also found good sources for the flat keyfob lights too, and those are very bright. When choosing a keyfob light, be sure it locks on, where the colored finger lights always lock on. Hey! where is the fuselage and the other two wings of that Fokker? I have one of those keyfob lights. They are awesome and very bright! I think those 1m LED strips from HK are really good and bright as well. I thought of using them on a depron plane and because it has a hollow airfoil, I tought I would glue the LED´s INTO the inside of the airfoil so the bright light will shine through the 3mm depron. The question is just how many mAh they need, because the plane just flies for about 5 minutes with a 500 3S. Does anyone of you have experiences with them? I have Yellow and White LED strip from HK, and they both take 400mA with 12V. How ever, they are made of 5cm segment (each 5 cm pulling about 20mA) So if you want to use less current, just shorten the strip. Thanks so much for telling me that! Next week I wanted to use a full LED strip for that plane and as I would have to glue the Strip into the wing, I wouldn´t be able to get it out again! I think I will use a 5 cm segment on each tip of the wing, and one on the back of the plane (not sure about that though) and yeah I´ll see then. Btw, do you mean that the full 1m strip will take 400mA with 12 V per minute? Thanks again for telling me that! The full 1m strip takes 400mAh (with 12V), so in one minute it takes about 400mAh/60=6,5mA. 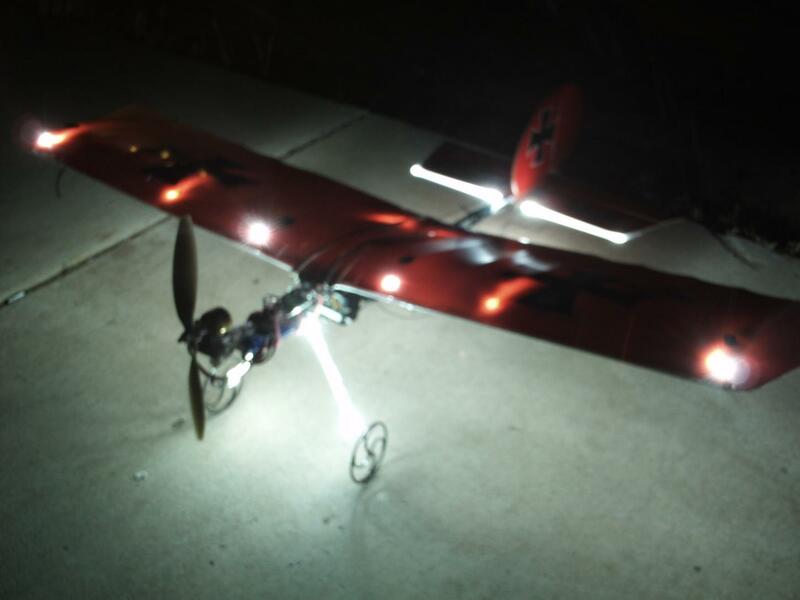 The planes in the following video are kitted out with the LED strips. One of them uses a 30 LED/meter strip and the other a 60 LED/meter strip....not much difference between them in terms of visibility. Don, thats a bit spastic for a music track for such graceful flights.... I didnt know the Chipmunks were so popular in Scotland! Love the fact that you simply took LED strips and put them all over the wing.Just looks awesome. Well I mean it depends really. The Bixler is not really that maneuvrabel (I definitely spelled that wrong, if someone could please correct me ) and needs large places for nice turns. Wings are much more sporty and aerobatic and can fly against a tree without breaking immediatly. Also because they are so maneouverable (this time correct? )you can fly them better at smaller areas. A Bixler would break much easier then a wing, so you also lower the risk of something break. Yeah, but it's theoretically possible? If you have enough space? Of course that way you can fly much more often than having to keep waiting for another parcel with the right parts. Searched someplace to make this post. The Bixler should be okay to fly in the night. But you will need at least the same space as flying in daylight. I did put some LED strips on my AXN Floater Jet/Clouds Fly. You can get them cheap on 5m rolls on ebay. Unfortunately I got the waterproof version thinking there would be clear paint on it. But it is clear rubber. And the rubber generates much drag and does weight some grams so I am probably tearing of the rubber (Buy the non waterproof ones). A picture for better understanding. I tore some rubber away so you could see it better. I see your problem... Is it hard to take off the rubber? Your plane looks awesome, it's like saying "Pimp my Plane!" I like how they all put red and green on each wing because these are the nautical colors. Thanks for the compliment. It is not that easy. You got to be very careful and it needs some strength so you don't ripoff the leds. The navigation lights for planes are the same. Yeah I know but I wonder why the nautical colours are the same as the navigation lights. LOL I can remember on the HobbyLobby J5 Cub they had led's on the wing tips. They were reversed.